With the reintroduction of the Power of 2 promotion I went ahead and signed up for a third Eve Online account. Why not? I need another industrial alt and I've grown attached to both Rosewalker and Wandering Rose and do not want to stop either of their training. So, what exactly do I look for in an industrial alt? First, the pilot needs to fly cargo ships because I don't want my main characters to have to haul small to mid-size cargoes. Eventually the alt will need to be able to fly a blockade runner because I'm a carebear and I'm not hauling cargo through low-sec in something that can't cloak. Next, the alt needs to aquire planetary interaction skills. I am looking at making two alts to run PI colonies to free up Rosewalker and Wandering Rose to wander the universe. Planetary Interaction is a nice source of income, but the feature has also tied me down pretty firmly to Metropolis and Heimatar. Third, I need research and invention skills. I really want to get into making more blueprint copies and perhaps more data core farming. And finally, I want my alts to be able to mine. We'll see how much patience I have with trying to get all of the skills in place. Having decided what purpose the alt would serve, I then had to decide what race to make her. Yes, her. I'm not sure why, but in New Eden women are smarter in business than men. So I'm following the stereotypes and making my industrial characters women. Anyway, my choices came down to Amarr or Gallente? Why? Because I want my pilots to fly blockade runners that can carry packaged cruisers, which limits the choices to the Prorator and the Viator. And since I'm in danger of having bad relations with the Amarr, I decided I needed an alt that could fly through Amarr and Caldari space just in case. "With the exception of the Khanid, the Ni-Kunni were assimilated into Amarr society far more easily than the majority of Amarrian conquests. Conquered more than 1000 years ago by the Amarr Empire, only a small minority would still be considered 'enslaved' by the rest of New Eden. Their home planet of Mishi IV in the Aridia Region is an inhospitable place, dry and desolate. The Ni-Kunni attribute their innate resilience and strength to the challenge of merely surviving in this harsh environment. Most Ni-Kunnis are tradesmen and artisans - occupations traditionally eschewed by Amarrians, but still a vital part of their society." "Ni-Kunni females are deceptively engaging individuals. Harboring an innate suspicion of others, they often use their charm to probe people for weaknesses. They are masters of reading intentions and motives while disguising their own emotions, and thus find gainful employ in numerous professions, legal and otherwise. Beneath their measured and delicate manner, Ni-Kunni women are more sly and cunning than their male counterparts." "The Amarr Empire imposes strict trading rules with other races, all but encouraging smuggling operations to flourish. The wily Ni-Kunni are experts when it comes to exploiting black market opportunities, and have spent generations perfecting their smuggling methods." That sounds exactly what I was looking for. I figure that a Ni-Kunni could plausibly oppose slavery within the Amarr Empire so would fit in with the Circus. So now that I created the alt, I just transferred all the cash I needed to the alt and won't play her for a couple of weeks until the skills train, right? Wrong. Perhaps I'm being foolish, but I decided I wanted to see just how fast a new character could get up to speed with planetary interaction with no outside help. So far, I'm doing pretty well, I think. I did the Military, Industry, Exploration and Business tutorials. I have bought all the skill books I need except for Planetology, which is rather expensive. But I have enough isk in my wallet to not only buy the book but set up my first colony once I finish the training in about a week. The only thing I have to decide is whether to keep my alt in Kor-Azor a few jumps from Amarr or transfer her to the Ammatar region of Derelik. She is a Border Runner, so that border region seems like a good roleplaying place to put her. Well, and the fact that the region is just a couple of jumps from Rens. If I do that, I'll need to have Rosewalker take the Orca to Amarr and pick up all the ships I've acquired. An excuse to fulfill some long haul courier contracts? I might make some money out of the move. On Thursday, I wrote about my decision not to play Star Wars: The Old Republic. I decided that I wanted to reserve the money for possibly getting a third account for Eve Online. Someone in Iceland must be reading my blog, because on Friday CCP announced another Power of Two promotion. That's a promotion for existing subscribers that gives 6 months of playtime for $49.95. Plus you get a Cerebral Accelerator which acts like +3 implants for all 5 attributes for 35 days. I wound up getting my second account that holds Wandering Rose two years ago with another Power of Two promotion. Since I was thinking about it anyway, I now have three accounts. If you had told me six years ago that I would have 3 accounts in an MMO that I would pay a monthy fee to play, I would have called you crazy. But here I am. Now to try the New Player Experience. I heard it got a lot better than when I started over two years ago. Star Wars The Old Republic: Yes or No? I have to make a decision relatively soon about my game playing. Do I line up for Star Wars: The Old Republic due to launch on 20 December or do I triple down and get another Eve Online account? At first, this may seem like a stupid question. Of course I'd play The Old Republic! I love science fiction and have seen all the Star Wars movies (yes, even Episode 1 unfortunately). And I haven't played an avatar-based game since I gave up on RIFT about 5 months ago. And Bioware always puts out great stories. And yet, I don't think I will play TOR, at least not at launch. Those pre-quil movies tarnished the reputation of the Star Wars brand for me. And I really don't think the devs will let me shoot Jar-Jar Binks on sight. I think I hate that bumbling, annoying character even more than I hate Hogger. The big thing for me is story. While Bioware makes a big deal out of the story being the "fourth pillar" of the roleplay experience, I don't think the devs creating the story is the answer. I'm tempted to sympathize with Jef Reardon of Massively.com's take on the story. "The good news on the story front is that the game takes itself pretty seriously. As a result, it features adult situations and thematic material and is mercifully free of the kid-friendly Clone Wars crud that's been crapifying the Star Wars IP for the past decade. Feel like threatening an orphan to make an Ord Mantell medicine-thief see sense? Go right ahead. Ditto for facilitating the local spice trade. "That said, I couldn't get past the fact that I'm playing a pre-destined BioWare avatar as opposed to my own character, and to be honest, if I wanted to passively consume content, I would watch television. When I sit down with an MMO, I want to play someone unique who can affect the world and the other characters around him, and in this respect, SWTOR simply isn't an MMO (or at least, it's not the kind I grew up with and wish to play past the free month)." I can agree with Bioware pointing to story as "the fourth pillar." But really, I think Eve Online's players do a better job of providing multiple stories that combine into a living world than professional writers for a theme park game ever will. Really, think about it. From the disbanding and collapse of BoB to the collapse of GoonSwarm due to failing to pay its bills to hundreds of players of the famously ruthless PvP game rushing to the defense of Chribba, Eve's biggest and most famous carebear, the stories are mind-boggling. And with the player generated stories, players never run out of content. For MMOs that rely on the developers to create the story, it never fails that players eventually reach the end of the content and thus the story. Perhaps I have become spoiled by Eve, but I'm having a hard time thinking that I would ever want to play a non-sandbox game again. Perhaps if I had some friends in the new game I'd try it, but Eve, to borrow a marketing phase, "Eve Is Real". Can Bioware's writers create such a world in a theme park game? I doubt it. I still might not get that third account unless I come up with a solid plan on how to play with three accounts. But playing Eve with three accounts seems a lot better option than playing TOR with one. So What Is Eve Online's Current Subscription Number? One of the burning questions surrounding Eve Online is just how many subscribers does the game still have? Given the latest information revealed in Brendan Drain's EVE Evolved article yesterday, I may have an answer that is relatively close. "More than 1000 player-made images, videos and posts have been received so far and the first level of sharing rewards has just been unlocked thanks to player enthusiasm for the extraordinary initiative, triggering a 1,000 Aurum reward for each of EVE's subscribers. "That's over $1.89MM USD worth of virtual currency and the equivalent of 107,000 months of gametime AKA PLEX." I realize that math is hard, but with each PLEX converting to 3,600 Aurum, that is a total of over 385.2 million Aurum given away. Divide that number by 1,000, and I get 385,200 accounts. The number probably was a bit greater than that. Now we get to the Massively.com article. In the article, Brendan Drain wrote that a source inside CCP told him that "the official word is that as of the week before the infamous apology, we had lost 8% of account volume." I can believe that number is relatively accurate, just based on activity levels I've seen. In August, the 7 day average of peak concurrent users dropped 10%. I did not run numbers in September due to being out of the country, but I get the feeling the numbers somewhat stabilized during September and October. Using the leaked number of 8%, then Eve Online saw a loss of some 30,800 accounts over the last couple of months. If my math is accurate, then Eve Online has approximately 355,000 accounts. Until CCP comes out and tells us differently, that's the number I will use. And for those wondering, according to the Q4 2010 Quarterly Economic Newsletter, Eve had about 357,000 accounts active at the end of 2010 (p. 8). While the announcement of the layoffs stated that Eve had more accounts than last October, judging by the graph in the QEN, it isn't by much. Some people are using last week's layoffs as proof that CCP is either about to go out of business or sold to a larger company. One prominent blogger who really hates CCP and Eve Online even used a post of mine to justify a prediction that CCP would declare bankruptcy in 2012. While I appreciate the traffic, my first thought was that analysis was, considering the well known views of that blogger, wishful thinking. I was sure that more objective and informed analysis would soon emerge from the Eve blog-o-sphere. "A closer examination of the financials in that June statement confirmed it: CCP had a burn rate of between 7 and 8.5 million USD per year. They needed to be at 6: 12 million USD over two years. Therefore, they were burning cash higher than the rate supportable by the loan. Therefore, what they were doing was not sustainable unless that investment started returning a profit before the two years were over. "That, obviously, did not happen. DUST isn't out yet. WoD isn't out yet. Therefore, they were going to be in trouble when that loan came due. Instead of trying to develop a second product, they tried to develop a second and a third product at the same time. "That made what happened yesterday at CCP inevitable. Hilmar had to show his investors that he was serious about making his business sustainable. In the longer term, CCP could repay that loan. But the ability to repay the loan isn't what this was about. This was about demonstrating that CCP had a sustainable business model that could fit within their burn rate and maintain liquidity. DUST still isn't out, which means that Hilmar needed to have that liquidity loan renewed by his investors. And that meant that he had to show his investors that he was serious about fitting his business within the burn rate for the next two years." So how much money will the layoffs save? According to CCP's 2010 financial report, CCP spent $38 million in salary and other employee expenses in 2010 (p. 21). If it is true that CCP laid off 20% of its workforce then the average employee count in 2010 of 558 was the employee headcount at the time of the layoffs. Assuming that the costs are approximately the same year-to-year, I feel pretty confident that the layoffs will save between $7-9 million in 2012. Cutting 20% from $38 million is $7.6 million, but with 80 of the 114 positions cut in the U.S., that number may be higher. Some have speculated about possible cost savings by closing the office space in Stone Mountain, Georgia (the U.S. state, not the country). The office wouldn't close completely since it is the home of White Wolf games, but with the cut of 80 of the nearly 200 employees CCP could choose to relocate next year depending on the term of the lease. CCP launched the opening of their Stone Mountain office in 2007, so it is possible they could move if they have a 5-year lease. Two other factor plays into the financial calculations. Up until now, the development of DUST 514 has just meant outlays that CCP paid for development. If all goes according to plan, next year DUST 514 will actually generate revenue. How much no one knows, but if the game just breaks even a lot of the financial pressure will lift from CCP. The second is the partnership with Nexon to produce a Japanese language client and customer services. If the effort brings in 30,000 new accounts, that would mean over $6 million in additional revenue per year. Of course, CCP needs to keep the Eve player base happy and its numbers at least stable for all of the financial theories to work. So far I think CCP's plans for the winter expansion will keep the player base happy. After this summer's events, most are probably waiting to see CCP's actions and not just rely on their words. But if CCP can "walk the walk", then the reports of CCP's demise are greatly exaggerated. The End Of CCP's War On Bots? 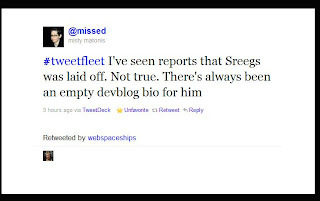 One of the 20% laid off by CCP on Wednesday was CCP Sreegs. Among other things, CCP Sreegs was in charge of CCP's War on Bots™. CCP could afford to wage all-out war on botting when times were good, but with the massive subscription drop that led to the layoffs, can CCP continue the war? I expect that all offensive action against botters will now end. In my opinion, CCP will continue to take action against those reported through the use of the "Report Bot" button, but that is about it. If players don't like botters, they will need to wage the war themselves. Edit: The information about CCP Sreegs being laid off is based on the empty dev bio on the Eve Online site. 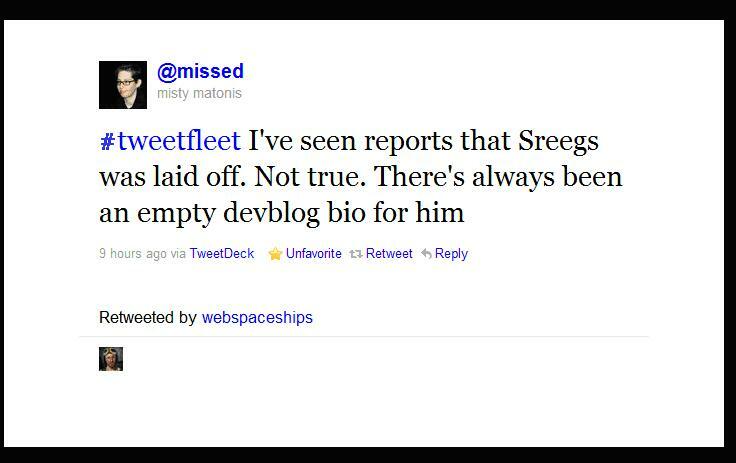 However, Misty Matonis, the former CCP Fallout, says Sreegs was not laid off. I'm glad I'm wrong. "In the 2011 winter expansion we‘ll certainly focus more than ever before on iterating and polishing up all the features that EVE has expanded to in the then eight years. What those specific systems are, I don‘t know as we haven‘t started the planning phase for that yet." Back in June 2010, CCP announced a strategic decision to concentrate on developing Walking in Stations while putting a relatively small group of devs maintaining Flying in Space for 18 months. With an $11.8 million loan due on 28 October 2011 (next Friday), CCP's management gambled that Incarna would bring in enough money to allow the company to continue to fully develop two new MMOs, DUST 514 and World of Darkness after the loan was paid off. Yesterday, we learned that the gamble failed as CCP was forced to lay off 20% of its workforce. At one point earlier this year, I thought CCP would succeed. CCP Soundwave's Team BFF got kudos for the new incursion feature and then became more popular by fixing many irritating features. Another group, Team Gridlock, began a successful campaign to reduce lag that gained a lot of respect from null sec pilots. And with CCP Sreegs beginning a War on Bots™ in March, all the signs were present for Incarna to explode and expand the popularity of Eve Online. Instead, the only things that exploded were players' rage and video cards. If CCP had been able to provide more than just the Minmatar Captain's Quarters, players may have accepted the new content. But besides only having what some called the "Minmatar Forever Alone Closet", the CQ also caused some players video cards to melt. This became a rallying cry for players in justifying their not trusting anything CCP said. Worse, from a business perspective, players took Hilmar at his word and began unsubbing. The CCP business model that encourages players to pay for multiple accounts began to hurt as players could cancel 2 or 3 accounts and still be able to play the game and, perhaps more importantly, post anti-CCP remarks on the forums. And since Hilmar stated that action was the only thing he would consider, players began to do exactly that if they did not leave the game entirely. With the payment of the loan in October looming, I believe that CCP needed to see a rise in Eve subscriptions in order to continue paying for development of both DUST and WoD. Instead, subscriptions declined. We don't know how much, but in August alone the rolling 7-day average of peak concurrent users on Tranquility dropped by 10%. If that drop in activity corresponded to lost subscriptions, that is possibly 35,000 subscriptions lost. Or, in financial terms, a loss of $500,000. Faced with that kind of loss, is it any wonder that Hilmar published his apology blog? He screwed up. But although I think many people suspected hard times were ahead, I was a bit shocked to hear about the layoffs yesterday while listening to Eve Radio. The fact that World of Darkness took the brunt of the layoffs, upon reflection, came as little surprise. If CCP could not release a multi-player environment like establishments, then I highly doubt that WoD was anywhere close to release. The thing that came as a shock, though, were layoffs to Eve's community team. CCP Fallout and CCP Zymurgist are confirmed losses. "As we reexamine our outward relations, we are also taking time to reevaluate our internal goals. In doing so, we have come to the conclusion that we are attempting too many things for a company our size. Developing EVE expansions, DUST 514 and World of Darkness has stretched our resources too thin. "Rather than allowing this to persist, we have made the decision to sharpen our focus. Sadly, this means reducing our staff. We estimate that around twenty percent of global positions will be affected by this process. These will be predominantly in our Atlanta, GA office, although select positions in our Reykjavik, Iceland office will be affected. "We are very sad to lose some of our talented and dedicated colleagues to this necessary process. Naturally we are making every effort within our means to help them find alternative employment. Decisions like these are difficult for all those involved and extraordinarily sad for all of those whose lives are affected. For the immediate future, our mission is to enrich the vast EVE Universe by strengthening the continuous development of EVE Online while preparing to bring DUST 514 to market on the PS3. We do this in order to realize our ambitious and challenging plan of joining the two in a cross-platform, truly massive online world. World of Darkness will continue development with a significantly reduced team. This team will continue to iterate and expand on the gameplay and systems they have designed. We will also redeploy creative teams in Atlanta to support the launch of DUST 514. "This will enable us to accelerate timeframes for new features and increase our ability to respond to community needs. The fruits of this realignment will be seen as early as this winter with the upcoming EVE Online expansions and the launch of DUST 514 private trials." We shall see what the future holds and if CCP can meet these reduced goals or if they will need to cut back further. But as many players rejoice that their game will get the work they longed to see, over a hundred people are receiving their notices of termination. Kind of hard to rejoice as that is going on. Is The Mittani The New Ken Lay? "But now if someone asks me whether an important policy and regulatory issue can be replicated in a virtual world, I can say that some players replicated energy market manipulation just for kicks." Oh My God, CCP Nerfed Chribba! While I was in Bulgaria CCP published a dev blog about the upcoming capital/supercapital changes. Just a few days before Chribba celebrated his 1 year anniversary of holding sov of the 9UY4-H system in Providence Sunday, CCP let loose the information that the Veldfleet, Chribba's capital/supercapital mining fleet, was about to be nerfed to hell and back. The changes that affect the Veldfleet the most are those eliminating the drone bays from all titans and dreadnaughts. That move will affect the four known titans Chribba owns. According to the latest available intelligence, Chribba fits his Avatar-class titan, The Veldatar, with 5 Modulated Deep Core Miner IIs and 5 Mining Drone IIs. When I put the fit into the Eve Fitting Tool, I discovered that the fit would mine 859 m3 of veldspar per minute given all skills at level 5. Unfortunately for Chribba, 36.4% of that total was brought in by the use of the mining drones. While I know that EFT does not take into affect such things as travel time to and from asteroids and times when combat drones need to be deployed to fight off rats, when the drones are deployed they can gather 312.5 m3 of veldspar per minute. The situation is even worse for Chribba's dreadnaughts. Dreadnaughts like the fleet's famous flagship The Veldnaught, stationed in the Amarr system, can only mount 3 mining turrets (and the Minmatar and Caldari dreadnaughts mount less). According to EFT, assuming that The Veldnaught is still equipped with ORE miners and 5 Mining Drone IIs, taking away the drone bays cuts the maximum possible mining yield of the Revelation-class dreadnaught (excluding fleet boosters) from 594 m3 per minute down to 281 m3 per minute if all skills are trained to level 5. Ouch! Would CCP really do that to Chribba? I hope not. Hopefully CCP will mitigate the loss of mining power by introducing some new extra-large mining lasers suitably for use on capital ships. Hey, CCP Zulu did say that new T2 items were going to be introduced in the winter expansion. Since he didn't list them, we can hope that Chribba will have some new toys to play with. Sofia, BG - As I may have mentioned, my first two weeks in Sofia was business and this last week is a vacation. Of course, the weather during the last two weeks was beautiful, sunny with high temperatures between 20-25°C. Of course, on Saturday, my first really free day, the rain and cold came. As I mentioned to a colleague on my first full day in Sofia, adventure is something bad happening to someone else. But, really, how bad is a little rain? Okay, what came down on Saturday wouldn't have been pleasant if I was walking home from the train station. But I was in Sofia. Did I mention I brought a rain coat and and umbrella? So instead of staying in the hotel, I took a bit of a stroll to the City Center Sofia mall. Walking the grounds of the National Palace of Culture was a bit different. No skateboarders. No bicyclists performing tricks. No families taking a stroll. No protests or political rallies. Just a steady drizzle and a few others like me walking to and from stores, if the percentage of people carrying bags was any indication. Perhaps if I lived in Sofia, I would have been wet and miserable. But as I was just visiting, I was in the mood to take in new sights and have a good time. I think Eve Online is very much like my experience in Sofia so far. In the high-sec zone of Chicago and suburbs, a gusting wind and chilly temperatures are a bad thing. In the lower-sec zone of Sofia, the rain is a different experience that brought a smile. In New Eden, players take bad experiences, losing ships, in low and null sec a lot better than if they do in high-sec. For a lot of players, myself included, geography dictates the style of play we expect to encounter. High sec is "supposed" to be safe while all other areas are not. Well, I don't expect high sec to be safe, just a bit safer, but hopefully you understand my point. When people don't get what they expect, a lot of them get cranky and the tears come in buckets. The trick is to not let where you are dictate your happiness but what you are doing. And if you are happy in one place doing something, shouldn't you be happy doing that same thing everyplace? I think that goes for life both inside and outside the game. How Do Minmatar Say No? Sofia, BG - One of the curious differences in body languages between Bulgarians and most of the rest of the world is how they indicate yes and no. For "no", instead of shaking their heads left and right, they nod their heads up and down. The story of how this came to be has a very Minmatar flavor to it. As was explained to me over dinner last week, when Bulgaria was under the Ottoman yoke, they were very interested in making sure everyone was a Muslim. One way they would do that was to place a blade across someone's neck and ask if they were a Muslim. If they nodded "yes", they were okay. If they shook their heads "no", they slit their own throats. As time went on, Bulgarians who didn't want to be Muslims, but also wanted to live, changed their body language. Nodding their heads was a signal for "no", while shaking their heads meant "yes". I supposed once the Ottoman's caught on to what was happening, they started asking a different way. After all, they were only killing fellow Muslims. That got me to thinking. Do the Minmatar have any unique quirks brought on by their enslavement by the Amarr? Besides Vitoc addiction, that is.